I get the scars and the one eye but…seriously, why the cat nose? After years of sneering contempt, Lucio Fulci’s zombie flicks are just now gaining some traction among the mass critical community. Nostalgia goggles allow everyone to view things like Zombi 2 or The Gates of Hell as artifacts of a bygone age now that we’re slumming among remakes and sequels. Not so with Fulci’s contemporaries in the Italian movie business, many of whom enjoyed long and critically acclaimed careers. Careers Western critics have studiously ignored, because the only people watching Italian movies that don’t feature zombies are art snobs who sneer at the zombie films. 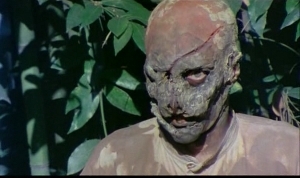 Not that there isn’t good reason to sneer at Zombi Holocaust; it’s nobody’s prize pony, despite being arguably the most famous thing in director Marino Girolami’s oeuvre. Girolami’s one of those guys you’ve never heard of with a filmography stretching all the way back to the 40s. By the time Zombi 2 debuted, Girolami enjoyed the kind of reputation you need to have if you’re going to direct films without Hollywood’s Power Elite. He was quick, but not sloppy-quick in the Herschell Gordon Lewis, Ed Wood style. More a professional, practiced quickness, recalling Roger Corman’s directorial heyday in the 50s.